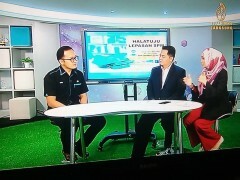 We are so proud when our senior counselor, Br Saiful Redza was on air with TV HIJRAH, to talk on direction or way forward after completing the SPM. The slot was under segment of Assalamuálaikum. The main objective was actually to guide students on how to make better career decision by choosing ideal courses whenever they apply for higher education through UPU system.